It's well acknowledged that markets are more efficient, and therefore create more value than non-markets. If I have 5 people bidding for the same project, I'm free to choose the best vendor for the lowest price. Without choice, then there's no virtuous cycle. I have to live with whatever there is. Well, with Web 2.0, API's really do drive innovation. Because suddenly social media became pluggable. Twitter, Facebook, Ning, Digg, Reddit, MySpace, and even Google products can work with new products in ways their creators could not have anticipated. We've seen this before. As Charles Mann points out in the recent article Beyond Detroit, the PC revolution was fueled by the interchangeable nature of every component of a computer. I could choose the best graphics card, whether it was ATI or Matrox or later on 3dfx or nvidia. I could get the fastest hard drive for the lowest price from Maxtor, Seagate, Western Digital, and the like. Intel vs. AMD vs Cyrix was another big decision. But everyone from hobbyists to the bulk buyers at Dell could choose the best. Because there was choice, everything got better and cheaper, faster. Why? Standards. And we need more of them in Twitter clients. Right now, there are none, to the detriment of consumers and the Twitter ecosystem alike. 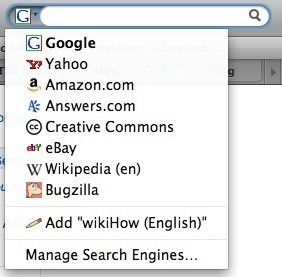 In Firefox, if I want to add a search engine, all I have to do is click the little tab and I can manage and add new search engines. The user has control. Yes, there are pre-set defaults, but it's not a closed system. If I want to use something, I can. It doesn't have to be in the box. I can add it myself. The Twitter clients haven't done anything like this. Each list of URL shorteners, picture posters, and every integrated service is a custom list that is hand-picked by the creators. Arguably they have no reason to open this up. Exclusivity is power. In a selfish, self-interested world, each rational actor only has to act in their own interest. Firefox allows plugins and modifications to their browser for critical features because they're a non-profit, and aren't bound by profit motive. Microsoft had to include the ability in Internet Explorer because the government forced them by rule of law in 2001 for being anticompetitive. Somebody call Dave Winer -- we need a common standard and someone to rally behind! After all, Twitter is the new RSS. Ev and Biz, maybe you can help? Twitter clients are playing in your playground. You have control of the API and ultimately you guys are the only ones who can make sure the playground remains a fair place for everyone to play -- not just the kids with extra money who can pay to play. In an era of re-tweets and re-blogs, what happens to truth? Following the crowd is best strategy for an individual until too many people follow the crowd, and then it’s a terrible strategy. The irony. In his blog post today, "Are social networks destroying knowledge?" Mike Speiser explores whether our new online medium is actually leading us astray in some way. I'd go further and wonder -- do we become more disconnected in that we have greater variety and choice in media? American political discourse has become more rabidly partisan than ever. Farhad Manjoo of Salon posits we are in a post-fact society where it's difficult to know what is true and not. I'd argue that social networks don't really make this post-fact society any better or worse. It's nothing new compared to the initial shock of the new that was Web 1.0. The only difference is now we can be misled a lot faster. The power of twitter search: A rice cooker just added you. Earlier that day, div_conspiracy tweeted something related to Posterous and it appeared on my tweetdeck: "tumblr or posterous? I don't have room for both. I see that tumblr just rev'd today." Moments later, I fired a quip back, "posterous.com revs every day." 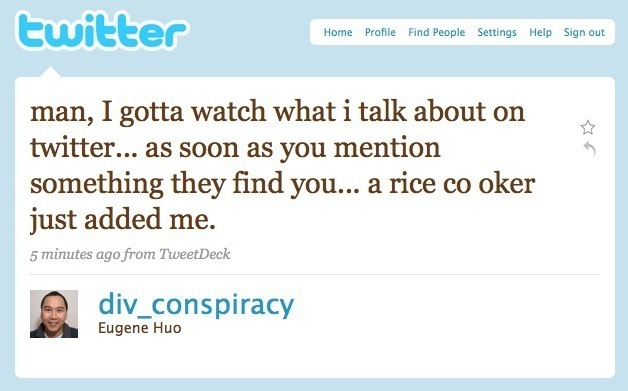 He then tweeted offhandedly about rice cookers, and Eugene suddenly got added by a twitter ricecooker. All within the span of a few minutes. People are definitely listening. I wonder if people will tweet less often if they know people are watching. Perhaps some will. But I doubt it. At the risk of pontificating about twitter vs facebook (that most egregious and trite of Web 2.0 blog offenses), I'd say that's the what makes twitter significant. Facebook is all about communicating with your friends and people I already know, but Twitter lets you talk about anything publicly. And that's the point. Someone told me once that online action is all about appealing to baser instincts -- greed, lust, thirst for fame, and the like. That's where Twitter fits in. Every time you tweet, you have a chance to expand your circle of influence. It's compelling because it is public. 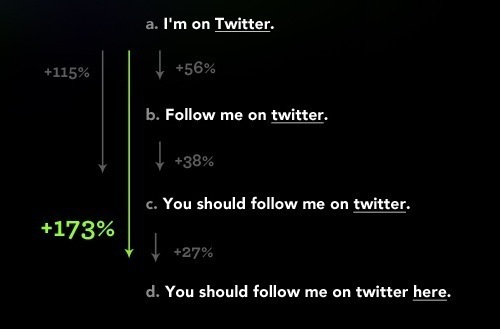 Psychologically, this results in a hedonic ramp of wanting to get more followers. People won't admit it, but subconsciously people want to become Internet famo (aka Web 2.0 famous, or almost not really famous). Hell, there's even a class at Parsons New School for Design called Internet Famous, on how to spread your work to the widest possible audience online through the 'online attention economy' of blogs, social media, etc. The same famo principle is at work with MySpace as well. Much has been made of the socioeconomic class divisions of social networks. But maybe those poor huddled masses of MySpace users are more likely to admit they want to be famous. Heck, it worked for Tila Tequila. How many services out there have made people famo? Twitter and MySpace. Others? To paraphrase the Hacker Manifesto: I am a twit, enter my world. The world of the electron and the tweet, the beauty of the blog.